Pedigree black and white bulls sold to a top of 3,650gns and 3,600gns at Holstein NI’s March show and sale, hosted by HA McIlrath and Sons Ltd at Kilrea Mart. Auctioneer Mark Stewart confirmed a steady trade, with 20 bulls (91%) selling to average £2,155 per head – an increase of £136 on this time last year when 16 bulls averaged £2,019. Topping trade at 3,650gns was the December 2017 Drumeil Goofy PLI £714 bred by Aidan McAfee from Aghadowey. This second prize winner was sired by ABS Mayday, and is out of Drumeil Mogul Delta Garlic GP83 who gave over 10,174kgs at 3.02% butterfat and 3.23% protein in her first 305 day lactation. This bull is a maternal brother to Drumeil Mayday Garlic ET PLI+745 – the number 19 PLI heifer in the UK. He sold to Basil Dunne from Ballinamallard, County Fermanagh. Judge Ian Watson, from the noted Majestic Herd in Coleraine, awarded the supreme championship ribbons, sponsored by Genus ABS, to the McLean family’s Relough Darlos PLI £363. Born in October 2017, he is by Relough Carlos ET, and bred from Relough Omen Danna 4 VG88 who averaged 11,778kgs at 4.13% butterfat and 3.27% protein in four 305 day lactations. The supreme champion was described by the judge as a medium sized bull with uniformity, breed character and nice bone. He came under the hammer at 3,600gns, selling to David Parke from Ballyward, County Down. 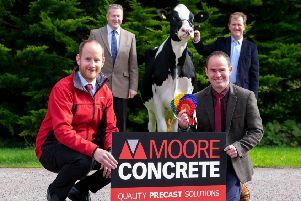 Claiming the day’s reserve championship award was the November 2017 Mullaugher Mane PLI £189 from Norman and David McNaugher’s herd at Aghadowey. This one is by JK Eder 1 Control, and out of the Gillette Jordan daughter Mullaugher Jordan Marie EX91 who is a sister to five EX and 13 VG cows. His dam gave 10,168kgs at 4.41% butterfat and 3.22% protein in her fourth 305 day lactation. Buyer at 2,700gns was Angus Bartley from Kilkeel, county Down. Also selling at 2,700gns was the thirteen-month-old Relough Roxday PLI £394 from the McLean family’s herd at Donaghmore, Dungannon. Another by ABS Mayday ET, he is bred from Relough Baxter Roxie 3 ET EX90 (2) who produced 11,382kgs at 4.14% butterfat and 3.13% protein in her seventh 305 day lactation. This third prize winner sold to Alan Liggett from Clogher. The January 2018 Relough Lyric PLI £459 attracted a bid of 2,450gns from David Parke, Ballyward. Also by ABS Mayday ET, he is bred from Ballycairn Leif Lily ET VG88 who yielded 10,333kgs at 4.17% butterfat and 3.24% protein in her sixth lactation. Claiming the honourable mention award was the September 2017 Bellemont Heathrow PLI £459 from Norman, Nancy and Nathanael McCollum, Coleraine. Sired by AOT Silver Helix ET, he is out of the home-bred Bellemont Oak Rhythm VG85. Class 1 – 1, and honourable mention, N and N McCollum, Bellemont Heathrow PLI £459 by AOT Silver Helix ET; 2, Inch Genetics, Inch Super by Endco Superhero ET; 3, Inch Genetics, Inch Phil by Inch Persistent. Class 2 – and supreme champion, R McLean and Sons, Relough Darlos PLI £363 by Relough Carlos; 2, and reserve champion, Norman and David McNaugher, Mullaugher Mane by JK Eder 1 Control; 3, Adam Watson, Derrydorragh Gravy by Westcoast Perseus ET. Class 3 – R McLean and Sons, Relough Danper PLI £633 by Westcoast Perseus ET; 2, Aidan McAfee, Drumeil Goofy PLI £714 by ABS Mayday ET; 3, R McLean and Sons, Relough Roxday PLI £394 by ABS Mayday ET.